Collette’s blogger Kristen Gilbert recently highlighted some of the most amazing species of birds that can be seen in Costa Rica — a country known for its biodiversity. Gilbert declared it, “one of the prettiest birds on earth!” Quetzal’s name comes from the Aztec word for “beautiful,” the Quetzal has a green body and red breast, and males grow a giant tail during mating season. Revered in Mayan culture, it was a crime to harm one. Of the 350 parrot species on Earth, Costa Rica contains 16, all generally hanging out in lowland forests. Great Greens are the most common, and the colorful Scarlet Macaw can be seen as well — especially in Corcovado National Park. In another demonstration of Costa Rica’s biodiversity, Over 50 of the world’s 330 hummingbird species can be found here — and Gilbert noted, “Even the most inexperienced bird watcher can spot them easily since they seem to hover instead of fly. These distinctive large-billed species are fairly easy to spot. They are also crucial to forest health, as their droppings spread seeds that create new trees. 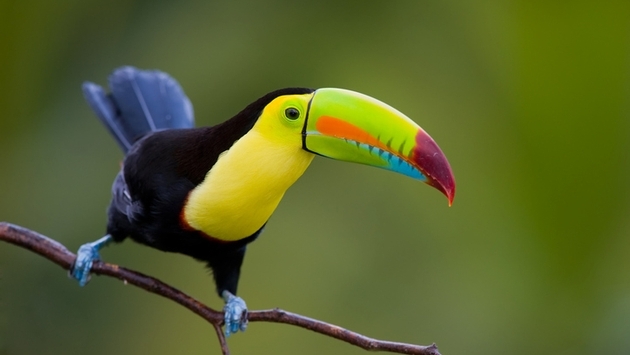 To learn more about Costa Rica’s avian bounty, visit Collette’s blog.